The map below shows the areas within the tropics which have all 12 months of the year with temperatures above 18 °C. The three types of tropical climate are classified as Tropical Rainforest or Equatorial (Af), Tropical Monsoon (Am) and Tropical Wet and Dry or Savannah (Aw). As can be observed in the map these three tropical climates are confined to a global band known as the Tropics which falls between the northern latitude of Tropic of Cancer and the sourther latitude, Tropic of Capricorn. The general pattern of the tropical climate is warm temperatures. Depending on the type of tropical climate, humidity is variable with Equatorial climates experiencing large quantities of precipitation all year round and Tropical Wet and Dry and Tropical Monsoon climates expereincing seasonal shifts in rain patterns. The most important climate control in regard to the tropical climate types relates to the position of the Inter Tropical Convergent Zone or ITCZ. The ITCZ is an area of low pressure and marks the point of trade wind convergence. These two roles make it an important ingredient in atmospheric circulation and give it a critical role in the formation of the Hadley cell. The ITCZ's location varies throughout the year and while it remains near the equator, the ITCZ over land drifts farther north or south than the ITCZ over oceans. This is due to greater variation of land temperatures. The location of the ITCZ can vary as much as 40° to 45° of latitude north or south of the equator based on the pattern of land and ocean. Despite these variations the ITCZ relates closely to the altitude of the sun and marks the point where the sun is highest in the sky. In temperate latitudes relative migration of the sun between the Tropic of Cancer and Tropic of Capricorn is responsible for creating the seasons but in tropical latitudes it is responsible for the migration of low pressure and the resullting shifts in seasonal tropical rains. The ITCZ and converging trade winds can be seen in the graphic below. The animation shows the shifting seasonal rains follow the the movement of the ITCZ. 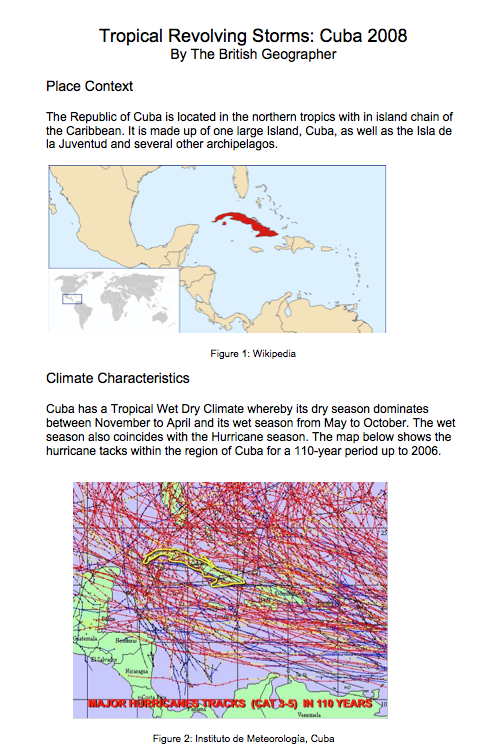 In addition to the ITCZ there are a number of other climate controles that influence the types of climate in the tropics. The influence of land and sea has a critical affect on the migration of the ITCZ. Due to the heat retention and stability of temperature within the ocean the ITCZ remains more anchored to one position over oceans. In contrast land temperature vary over the year and temperature is also influenced by altitude and relief. These factors create greater ITCZ migration and climatic variation north and south over continents. In Tropical Monsoon Climates the ITCZ can interact with other climatic patterns such as offshore winds that form as a result of deep lows over land. In combination with the ITCZ this helps produce enormous seasonal rains. 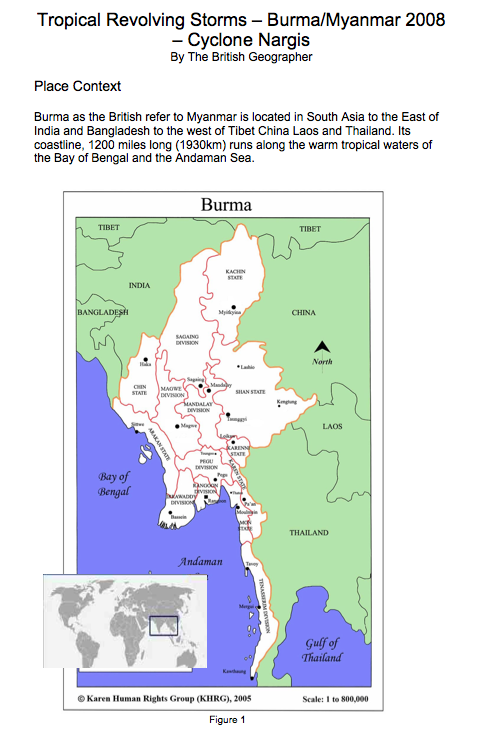 The second distinctive climate feature of tropical regions is the dry season. As you can see from the diagram to the right of the Hadley circulation air rises above the ITCZ to create a low pressure zone, characterised by high humidity and rainfall. Further north and south of this zone air begins to sink. As air sinks it becomes warmer. Remember warm air can hold much more water vapour than cold air. As a result of its warming its relative humidity falls and moisture gets locked inside the warm air. The air continue to sink warming further. The resulting atmospheric conditions are hot, dry, calm and clear skies with high pressure, called Tropical Anticyclones.Theoretically there is more moisture in the air at these latitudes than above the British Isles but you just can't see it. Over time the ITCZ migrates north and south and with it we see the migration of the warm dry highs. The Equatorial Climate is characterised by hot average temperature all year round and high monthly precipitation, typically no less than 60 mm a month with annual precipitation tending to be over 2000mm. The diurnal temperature range is greater than the annual temperature range. The reason for this regular climate is due to a feedback between low pressure convectional processes that result from the high altitude of the sun (ITCZ) and the high levels of soil moisture and interception of rainfall from the dense vegetation cover leading to transpiration. This feedback leads to a repetitive climate pattern of hot humid air, dry but misty mornings and late afternoon downpours and convectional storms. The Equatorial Climate is easily recognisable in its climate graph. To the right Singapore's climate can be seen to have high flat temperature line (above 25°C) all year round and rainfall of no less than 150mm in the month, reach a maximum of 270 mm in December. It s temperature range is just 2°C and its monthly rainfall minumum/maximun is 150 mm/270mm. Tropical Dry and Wet Climates with less than 60mm in any single month and lower than 1000mm annual rainfall. They are characterised by dry and wet seasons that relate to their situation in regard to the equator and the migration of the ITCZ. Effectively as the ITCZ migrates away from the equator a zone of low pressure and converging air tracks it. At this zone of rising air seasonal rain occurs due to convectional forces. As you can see in the map the location of Tropical Dry and Wet Climates can be found north and south of the Equator within the tropical belt. A good example that illustrates the climate type can be read in the tail of two cities, referring to Kano and Lagos in Nigeria below. From the graph we can see the pattern of rainfall is quite different throughout the year in Lagos compared to Kano. Lagos has a more humid climate experiencing rainfall in all months of the year, with a maximum monthly rainfall of 16.3 inches in June. In addition Lagos appears to expericnce a rise, fall and rise in rainfall patterns. This pattern of rainfall occurs as a a result of the ITCZ passing by two times in the year. Once as it migrates north towards the Tropic of Cancer and secondly as it returns sourthwards in the direction of the Tropic of Capricorn. In contrast Kano experiences a much more clearly defined dry season and (singular) wet season. Between November and March, no precipiation falls in Kano. The rains arrive in May and remain until September/October, with its maximum rainfall remaining significantly lower than Lagos at just 11.3 inches. 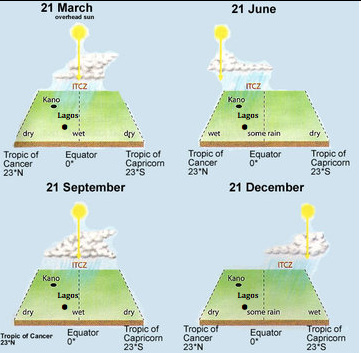 The diagram to the left illustrates the impact of the shifting ITCZ throughout the year in Nigeria. As you can see, the ITCZ shifts north to the Tropic of Cancer between March and June. It delivers rainfall to Lagos earlier than in Kano because the ITCZ reaches Lagos first. By June the ITCZ stands over the Tropic of Cancer and rains have reached a maximum in Lagos. The heat of the sun is now producing convectional rain for Kano as well but it won't be until July/August that Kano experiences its maximum rainfall. By August/ September the ITCZ has returned to Lagos and delivers increased preciptation for the second time. In December, the ITCZ has migrated south to the Tropic of Capricorn and so both Lagos and Kano experience their dry season. Tropical Monsoon Climates are relatively rare. They have a monthly mean temperatures above 18°C in every month of the year and feature wet and dry seasons as described above. Unlike Tropical Wet and Dry Climates however, a Tropical Monsoon Climate experiences greater than 1000mm of rainfall in the year. In addition a Tropical Monsoon Climate tends to see less variance in temperatures during the course of the year. This climate has a driest month which nearly always occurs at or soon after the "winter" solstice. Tropical Monsoon Climate can come in two distinct forms. The first features wet and dry seasons, with less pronounced dry seasons. Regions with this form of Tropical Monsoon Climate typically see significant amounts of rain falling during the wet season, usually in the form of frequent thunderstorms with a less pronounced dry season. The second form of Tropical Monsoon Climate features wet and dry seasons, with extraordinarily rainy wet seasons and more pronounced dry seasons, similar to that of Dry and Wet Tropical Climates. However, the dry season is followed by a sustained period of extraordinary rainfall. In some instances, in excess of 1,000 mm of precipitation is observed per month for two or more consecutive months. Areas which experience Tropical Monsoon Climate are affected by monsoon winds which blow in from the sea in summer and bring with them the seasonal rain. These can occur in both hot and cooler areas but are most commonly found in parts of Asia, the Indian Subcontinent and other areas around the Pacific Ocean. These seasonal winds are drawn into the continental interiors due to the intense heating of the land. Continental interiors like those found in India experience immense warming and the uplift of air is also helped by the Himalayas as shown in the video below. In the wet monsoon season warm moist air is drawn into India from the Indian Ocean. 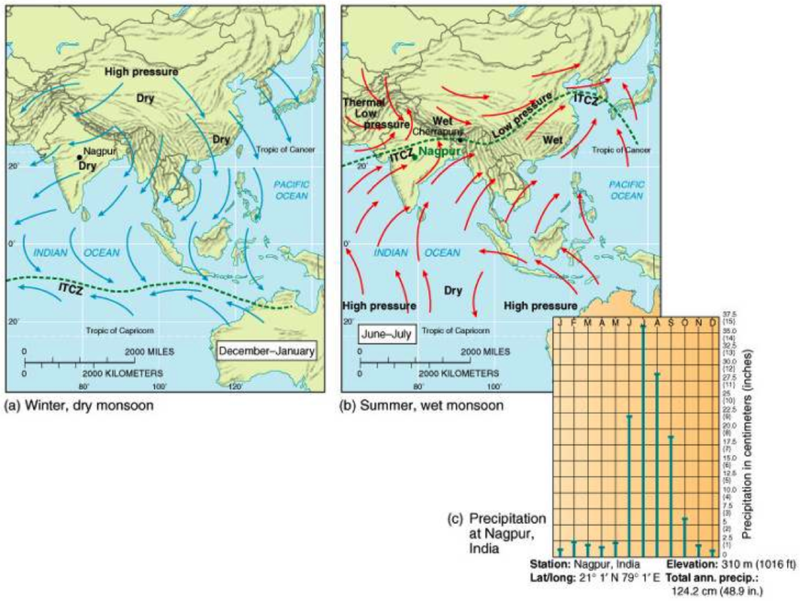 The Monsoon dry season is caused by a reversal of winds due to the migration of the ITCZ south. This wind reversal can be seen in the map below. For the purpose of the AQA A level students are required to look in depth at one region influenced by one type of climate. In some ways this has already been done above in regard to Nigeria and the Tropical Wet Dry Climate. However, I wanted to look more closely at a region of India. 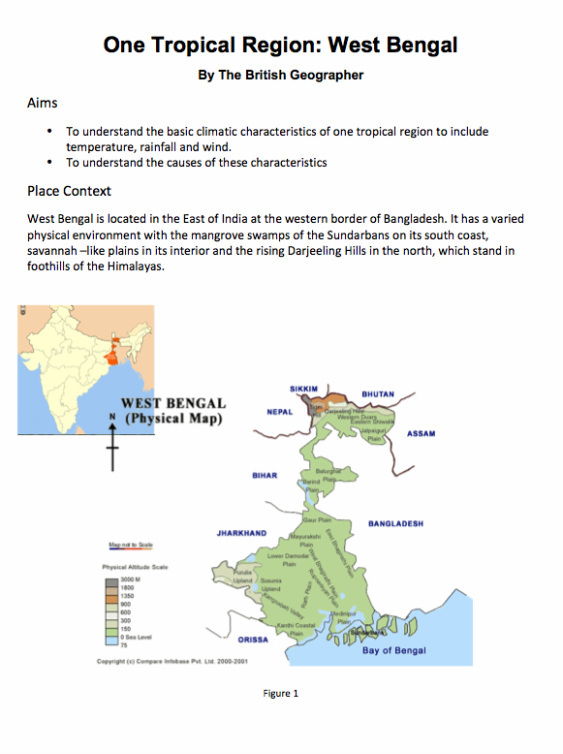 West Bengal allows the students to develop a greater complexity of tropical climates in one region, including, Tropical Wet and Dry Climate, Monsoon, Mountain influences and Tropical Cyclones. This case study has been developed in the follwoing PDF. Tropical revolving storms form over warm tropical waters towards the hot and humid season in close relationship with the migrating ITCZ. Central to the formation are converging trade winds and the development of low pressure troughs along the ITCZ. This in turn creates strong divergence that feeds into the formation of tropical depressions. These tropical depressions can cluster around a low trough. As the convergence becomes stronger they become more organised and revolve around each other to form tropical cyclones. 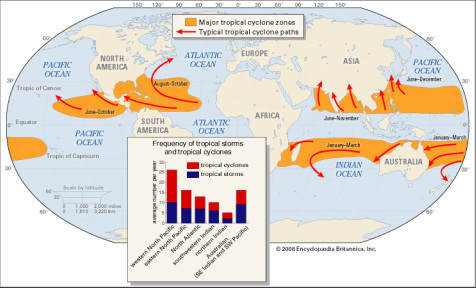 Tropical Cyclones are known by different terms. Tropical cyclones in the Indian Ocean, Typhoons in the West Pacific and East Asia, Hurricanes in the Atlantic and East Pacific. A fully matured cyclone can be seen in the diagram below. The system has strong convergence of air from above that draws upper wind into the vortex at the centre, known as the eye. Surface winds are also drawn into the system from below and they rotate into the system and compress the system's structure further. The structure is built up by a series of rainbands that increase in size and energy towards the centre. The BBC video below helps explain the development of hurricanes that affect the climate patterns of the West Atlantic, Carribean and USA. Tropical Storms form as a result of the development of tropical depression forming around the low pressure zone called the ITCZ. In the diagram to the right the converging trade winds can be observed along the equator. Because the coriolis effect is weakest at the equator the trade winds are almost parellel to the ITCZ. This helps produce a very narrow band of clouds. When the ITCZ lies south of the Equator, as it does in the Western Pacific and Indian Oceans, the Northeast Trade Winds develop a northwesterly direction (due to the influence of the Corilis effect). In the diagram to the left we can see the convergence is much stronger and Tropical Depressions form. The converging winds at the low, encourages a clockwise rotation in the Southern Hemisphere. When the ITCZ lies north of the Equator, the Southeast Trade Winds develop a southwesterly direction after crossing the equator and again this convergence develops a Tropical Depression. Tropical depressions tend to move from east to west at a rate of about 10 to 12 knots. In most cases these disturbances are shortlived. But in some cases where surface factors allow for rapid evaporation of warm water and converging winds establish a highly structured cluster of Tropical Depressions then all the ingredients are there for a Tropical Cyclone to establish itself. The following image below shows the track of tropical waves along the ITCZ in the Atlantic Ocean before they develop into cyclones. The following map shows the tracks of cyclones along the latitute in the Atlantic and Pacific Oceans. The track of cyclones are highly undpredictable and variable. The life cycle of cyclones is also highly variable. Some form and decay quite quickly within a matter of hours, whilst other systems grow in strength and develop over several weeks. The actual path of the cyclone is decided by the balance of many factors, including the influence of ocean temperature, areas of high and low pressure and the balance between upper wind and surface wind convergence. Ocean temperature of 26.5°C or higher to a depth of 50 meters or deeper provide the perfect conditions for rapid evaporation of ocean water. this evaporation suplies both moiture to the system as well as latent heat and energy. What is clear to see in the satellite image above is the general direction towards the west in the northern hemisphere. The image below shows the general track of hurricanes in the Atlantic as they approach the Caribbean and USA. 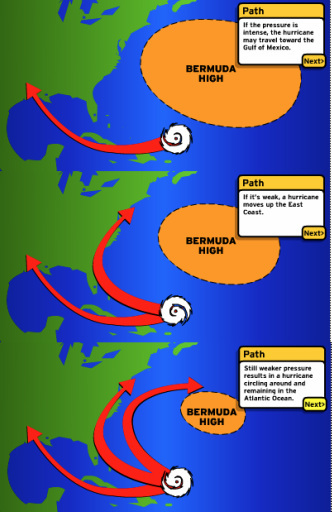 The dominant influence on the path relates to the size of the Bermuda High, which acts as a barrier. When large, it forces a more southern path into the Gulf of Mexico, as the high reduces in size the path of the hurricane takes a more northern route along the East USA coast.